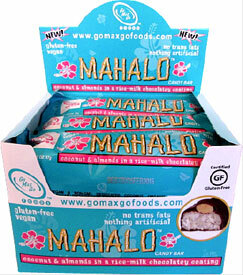 The Mahalo vegan candy bar by Go Max Go has coconut and almonds in a rice-milk chocolatey coating. If you crave a gently sweetened coconut candy bar topped with three whole dry roasted almonds and covered in a luscious chocolatey coating… hang loose, the Mahalo bar is for you! Made only with GMO-free natural ingredients, the Mahalo bar contains nothing artificial, has no hydrogenated oils or trans fats, and is naturally cholesterol-free. Mahalo vegan candy bars are 2 oz. (57g) in size, and this box of 12 individual bars is just $26.89, which saves you 10% off the normal price! *NOTE* - Chocolate can melt in the summer heat, especially if your destination area temperature is in the mid 80s or above when the package takes more than a day or two in transit. We recommend expedited 2nd Day Air shipping (if you are not normally within a 2-day ship time via Ground service) and a cold shippers for orders where you want to minimize the risk of melted chocolate, and that it is delivered where someone will be there to accept the package at time of delivery (work address if not at home). We cannot accept responsibility for melted chocolates, so please order at your own risk! From Rachael of cincinnati, Ohio on 10/27/2018 . These stand up to any non-vegan candy bar. They are even better than that version actually !! !